Artykuł na temat nowej generacji chińskich nuklearnych łodzi podwodnych. Type 09V i 09VI. What will Chinese nuclear submarine production look like in the future? Recently a number of news articles relating to Chinese nuclear submarines have been written. These include reporting on a test launch of a new submarine-launched ballistic missile (SLBM), as well as reviewing the number of Chinese ballistic missile submarines (SSBNs) and nuclear attack submarines (SSNs) in service. 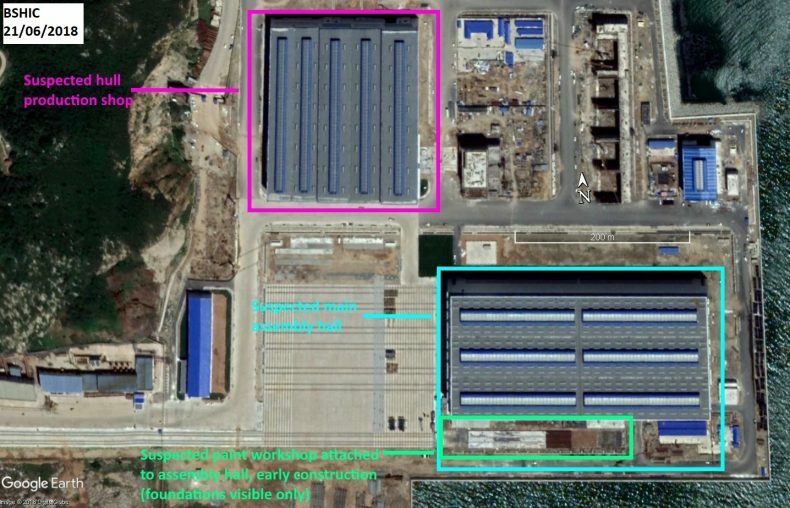 A rumored new nuclear submarine production facility under Bohai Shipbuilding Heavy Industry Company (BSHIC) at Huludao may also be edging closer to completion. Therefore it’s a good occasion to reflect on what Chinese nuclear submarine production may look like in the future. Satellite imagery of Huludao and other nuclear production yards around the world will be examined to try and gauge the sort of production capacity the new Huludao may yield — if it is indeed for nuclear submarines. All satellite imagery is open source, acquired from Google Earth. A number of articles since mid-2016 have suggested various new buildings and infrastructure constructed at BSHIC would become China’s new nuclear submarine production line. Huludao is home to BSHIC, China’s only shipyard that constructs nuclear submarines, and these new facilities were under BSHIC. Land reclamation at BSHIC has occurred since 2014, with a number of large foundations and buildings constructed (Figure 1), including a main assembly hall, a pressurized hull production shop, a painting shop, and a number of transport rails. Pictures within the newly constructed assembly halls also prompted some Chinese military enthusiasts to compare it with interiors of other nuclear production halls around the world. However, a very well written critique by Capt. Chris Carlson, USN (retired) suggested the new facilities are not intended for nuclear submarines. The thrust of Carlson’s argument revolves around two main points. First, rail lines from the new facility are blocked from reaching the main drydock due to a 6 meter concrete wall. Therefore newly completed submarines will be unable to be launched, as completed submarines would be far too heavy for drydock gantry cranes to lift. Second, Carlson argues that the foundations atop the reclaimed land are insufficient to support large and heavy loads like submarines. SSNs can displace up to 8,000 tons and SSBNs over 15,000 tons, surfaced. Carlson’s first argument regarding the rail line reaching the drydock is very logical, as there is very clear past satellite imagery showing the rail lines did not reach the drydock’s edge. 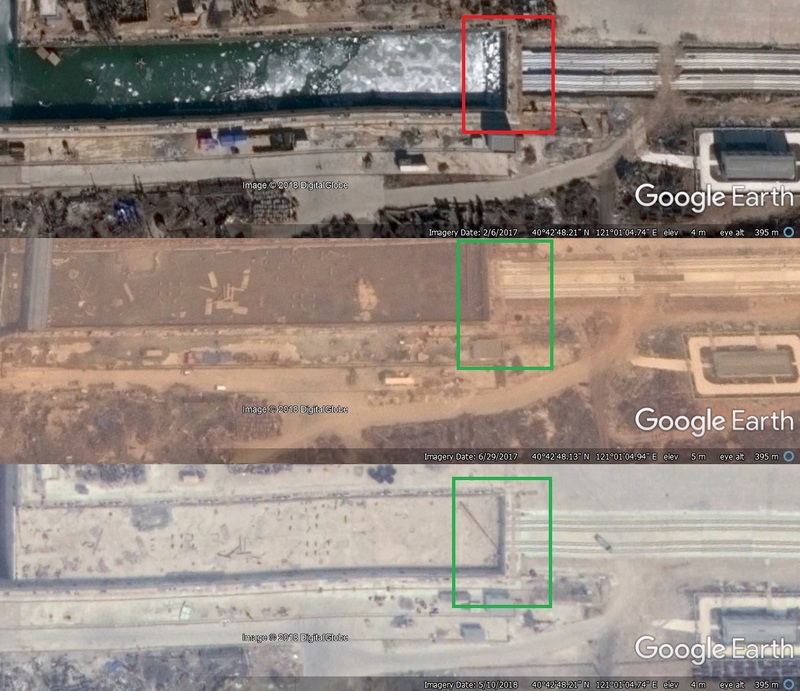 However, imagery taken in mid 2017 demonstrates the rail line had been extended up to the drydock’s edge, and all subsequent photos of BSHIC confirm this (Figure 2). The extended rail line virtually eliminates Carlson’s first premise, as there is now a direct transport path for completed submarines to the drydock, provided there is a floating drydock platform to receive hulls. Carlson’s second argument is more difficult to evaluate. The accuracy of estimating the new facility’s load bearing capacity based on intermittent satellite imagery of the foundation’s construction is debatable at best. 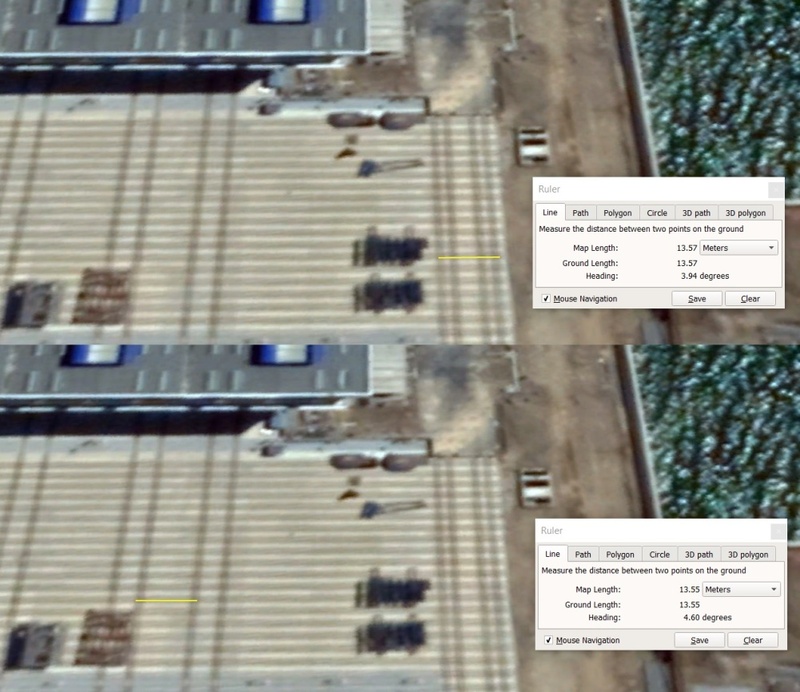 Not only is the imagery used for the estimates of less than optimal resolution, but months may pass between imagery updates on Google Earth, where substantial work may have occurred unobserved. For the purposes of this article, we will keep the plausibility of Carlson’s second argument in mind, but operate under the assumption that BHISC’s new facility could be for nuclear submarines. Finally, the website East Pendulum has documented many reports and visits from staff associated with the Chinese nuclear submarine industry and the overall construction of BHISC’s new facility, further adding weight that it is intended for nuclear submarine production. Assuming that the foundations of the new facility are sufficient for bearing nuclear submarines, the most immediate question of interest is what submarine types the new facility can construct and how many could be constructed at any single time? To answer this question, it is most instructive to first look at the main assembly hall. At 288 meters long and 135 meters wide, the assembly hall is further divided into three rows, which will be referred to as “production ways” for this article. Each production way is 288 m long and about 45 m wide (Figure 3). With satellite imagery, it is possible to identify that each production way is further divided in half lengthways, because each production way has a pair of rolling doors as well as a pair of associated 7.34 m gauge rail lines leading into each door (Figure 4). In other words, each production way has two 7.34 m gauge rail lines, with each rail line composed of two tracks for a total of four “rail tracks” per production way. A 7.34 m gauge rail line would be sufficient to accommodate a cradle necessary to support a 10-12 m beam submarine consistent with many contemporary SSNs, such as the U.S. Virginia and Seawolf classes or the U.K. Astute class. Furthermore, one can also observe a 7.34 m gauge rail line leading out from the foundations of the future paint workshop toward the drydock, which makes sense as any complete SSN would be transferred to be painted before launch. 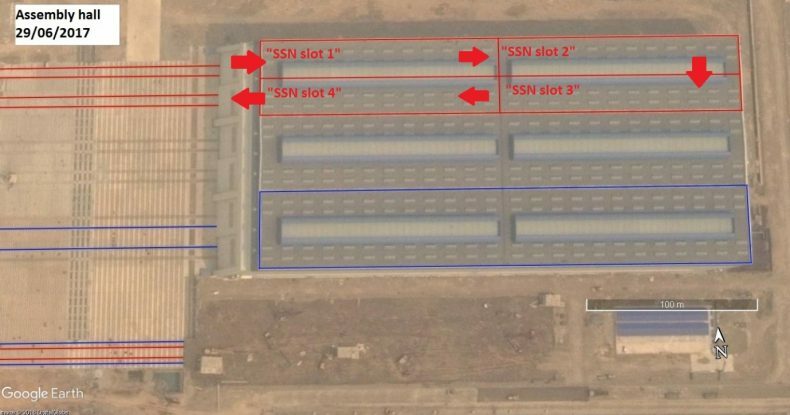 Therefore, based on the 7.34 m gauge rail that leads out of the production ways as well as the paint workshop, it is possible to conclude that the new facility is very likely intended to produce SSNs with a beam of possibly 10-12 m. It is widely expected that the next generation Chinese SSN will be the 09V class. However, the rail line leading from the paint workshop to the drydock is actually made up of two gauges. The first gauge is 7.34 m as previously indicated. However, a second rail line gauge is also present, at about 13.55 m wide (Figure 5). 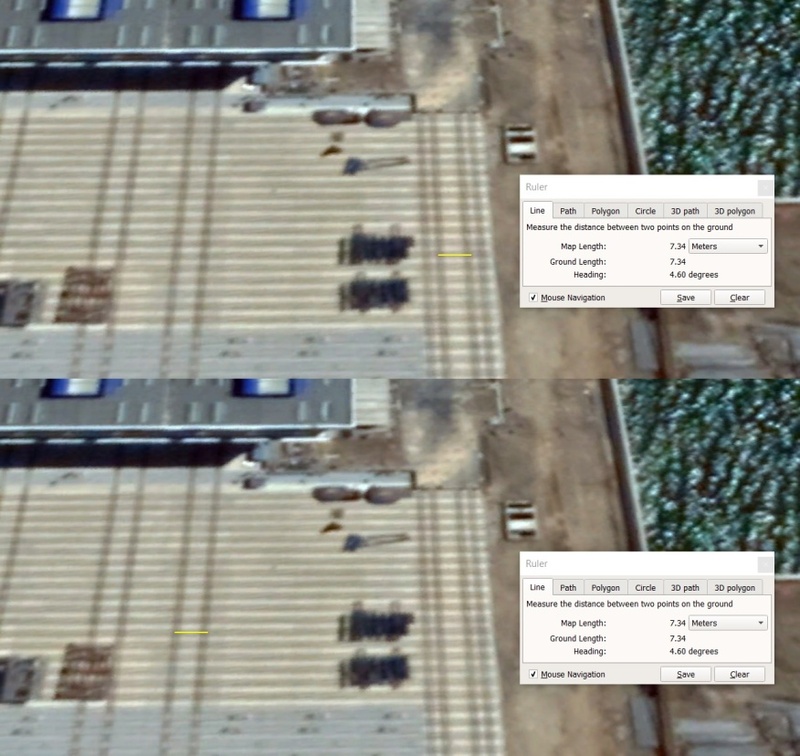 As previously mentioned, each production way features four “rail tracks” that make up two 7.34 m gauge rail lines; however, the central two “rail tracks” of each production way actually make up a 13.55 m gauge rail line as well, as confirmed on Google Earth’s measurement tool (figure 5). A 13.55 m gauge rail line is more than sufficient to accommodate cradles necessary for modern SSBNs such as the U.S. Ohio class or Russian Borei class, which have beams of 13 m and 13.5 m respectively. The next generation Chinese SSBN is thought to be designated the 09VI class, and may accommodate the new JL-3 SLBM. A 13.55 m gauge rail line may be capable of supporting even wider cradles for larger nuclear submarines in future, perhaps upwards of 18 m in beam; however this could merely be a case of future proofing the facility’s rail gauges as well. -SSN configuration: two 7.34 m gauge rail lines are utilized, making use of a production way’s full four rail tracks. -SSBN configuration: one single 13.55 m gauge rail line is utilized, making use of a production way’s two central rail tracks. Estimating the number of theoretical SSNs or SSBNs that could be assembled in the overall assembly hall will require some basic arithmetic. For the SSN configuration, it is also possible to see and deduce that each 7.34 m gauge rail line is placed slightly medial to their half of each 45 m wide production way. This provides a 22.5 m width for each 7.34 m rail line with about 9 m of clearance laterally from each wall or separator, and 9 m of clearance medially from the adjacent submarine. Nine meters of clearance for a rail line supporting a 10-12 m beam SSN should be sufficient for each production way to work on two SSNs alongside each other. However, each production way is 288 m long, and most contemporary SSNs measure less than half that length. For example, the Virginia class is 115 m long and the Astute class is even shorter at 97 m. Therefore, it is unlikely the full 288 m of each 7.34 m rail line would be used for assembling a single SSN. In fact, assuming that 09V has a similar length to the Virginia class (which itself is among the longest contemporary SSNs in service), it would be possible for each 7.34 m rail line in a production way to accommodate two SSNs in tandem with room to spare for clearance. Linking the above information together, each production way could be capable of accommodating work on four contemporary SSN sized nuclear submarines at once, with each “SSN slot” measuring 144 m long and about 22.5 m wide, i.e. : half the width and half the length of the overall production way (Figure 6). Considering there are three production ways that make up the overall assembly hall, the theoretical number of “SSN slots” for the overall assembly hall is 12. Of course, it is unlikely that 12 SSN sized submarines will undergo work in the assembly hall at the same time; however it provides a ceiling figure. Of note, if each production way worked on four SSNs simultaneously, it would require a “U-shaped” production line for new modules to enter a west-facing door for each production way and to leave via the other west-facing door (Figure 6). In theory it’s possible for a production way to work on “one and a half” SSBNs at once, where modules for new SSBNs can be moved into the production way behind a SSBN that has already completed assembly; however that would require entrance doors on the east side of the overall assembly hall. Such doors have yet to be observed. Therefore, at this point it is estimated that each production way can only work on a single SSBN sized submarine, with the overall assembly hall capable of working on three SSBNs at once. If the new BSHIC facility is intended for nuclear submarine production, the assembly hall allows us to estimate the potential production rate in future. Going by past practice, it is likely that the assembly hall will simultaneously construct a combination of SSNs and SSBNs. For example, one production way may be allocated to work on four SSNs at once, while the two remaining production ways work on each assembling one SSBN. Such an arrangement, once mature and properly organized with efficient pre-assembly module fabrication, may enable two SSNs and one SSBN to be launched every year. Observers may wonder whether the Chinese navy would require sustaining such a fast rate of nuclear submarine production considering the anemic production pattern of the last generation of 09III and 09IV submarines. However, a decade ago similar thoughts could have existed for Chinese destroyer production – yet in 2018 alone, six new destroyers were launched (three Type 055s and three Type 052Ds). Other commentators may express skepticism regarding the competitiveness of future mass produced nuclear submarines, as the 09III and 09IV classes are widely considered to be noticeably inferior to SSN and SSBN designs in other leading navies. However it is worth recalling the 09III and 09IV classes were designed and built in the 1990s by Chinese shipbuilding industry and technology of the time. The upcoming 09V and 09VI classes will likely be built using mid to late 2010s technology.